AL: Do you remember when you first read his poetry? To what extent are you/the reader interested in it as poetry, and to what extent as part of his story (as an Apollo founder, as an experimenter, an innovator)? What about his other works, literary criticism & historical works & theatre? Will some of his translated work be a part of your book? Do you think some of his works, translated, would interest English-language readers today? Or, re-issued, Arabic readers today? JG: I can’t speak to what would interest English-language or Arabic readers today. Poetry as a rule attracts a special readership. Arabic poetry of that period is of great interest to scholars. I tried to read Abushady’s poetry while I was at McGill. The Institute has a number of volumes of his poetry in their library. But it was rough going. There was no way, and there is still no way that I, or even many native Arabic speakers, can get a handle on what he was enacting in the Arabic language through poetry. The only people I know who can easily read the poetry of the period and who know and feel what he was doing with language are Arabists and linguists. The rest of us may have to take their word for it. Sadly, most of the translated excerpts I’ve found in dissertations and such are inadequate if not downright awful. It’s probably the most difficult thing to do, to translate poetry. You have to know both languages intimately, and you have to be a poet. But I do know someone who meets all of these criteria, and who has agreed to translate one of Abushady’s love poems for the book. So that’s very exciting. Apparently, love poetry was his strong suit. When he published his diwan Zaynab in 1924, it was new, fresh — unlike anything that had been done. It helped open the way for what developed into an era of creative experimentation in poetry. AL: How would you describe the influence of the Apollo, in Egypt and beyond, especially considering such important figures as Kamel Kilani, Abu-Qassem El-Shebbi, Ahmed Shawqi were involved? What role did your grandfather play? JG: In the Arab world, poetry was stagnating. People were aware, whether they were happy about it or not, of the new kinds of writing being produced elsewhere in the world. There was a very real interest in Modernism across all the arts. Abushady’s vision was for a truly contemporary Egypt. He believed the only way forward was through hybridity and inclusiveness, discussion and debate. In Apollo he published criticism and reviews as well as poetry. He also rather infamously published monographs authored by himself and others on topics such as poverty, religious faith, women’s suffrage, and atheism. When the great Bengali poet and Nobelist Rabindranath Tagore visited Egypt in 1926, he stayed with Ahmed Shawqi. There is a very moving passage in one of my grandfather’s diaries about their meeting, and about their shared belief that poetry offered a universal language. 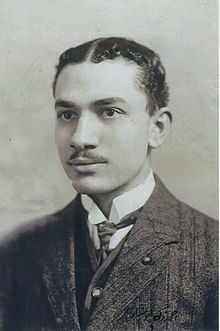 Abushady really believed that international peace could be achieved and that poetry played an active role in the process. Apollo’s Society, some members posing in the garden in 1935. 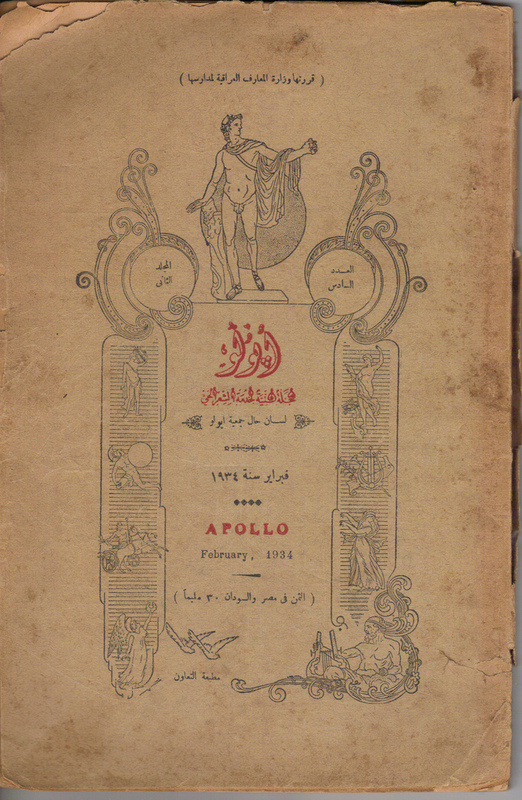 Abushady’s poetry journal Apollo (1932-34) stopped publication for financial reasons after only two years, but its influence was disproportionate to its run. 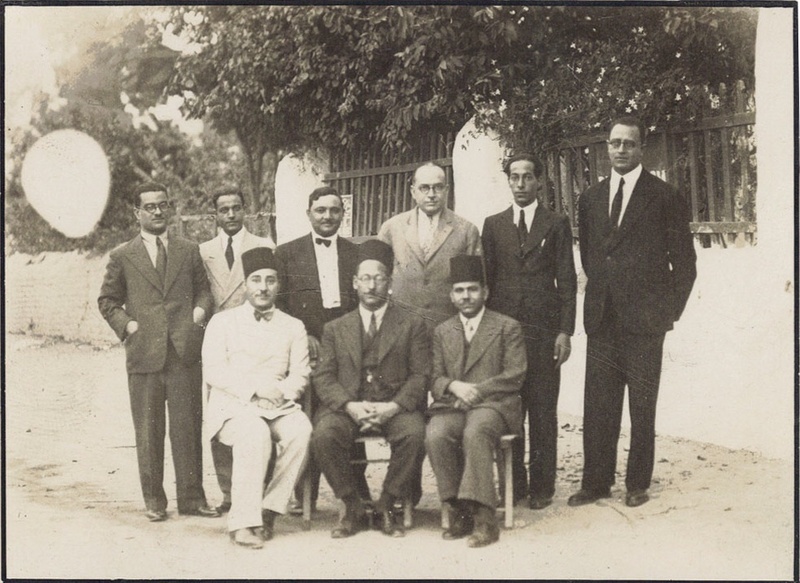 The group of poets, writers and artists he assembled around it, which he called “Apollo’s Society,” and the work they produced, represents the first wave of Modernism in Arabic poetry. And that wave was sustainable. 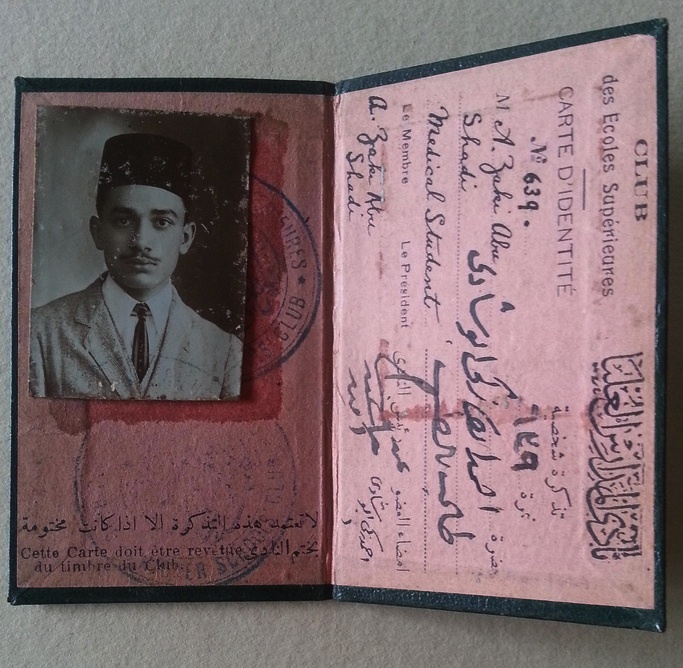 The journal was also unique in that it reached out to writers beyond Egypt’s borders. Abu-Qassem El-Shebbi, as you mentioned, the great Tunisian poet whose verse became popular again in Tunisia and Egypt during the revolutions of 2011, published his poetry for the first time in Apollo. Abushady generally played an avuncular and diplomatic role, encouraging young poets like El-Shebbi, and publishing their work at a time when the more established, conservative publications refused to do so. Shawqi was the éminence grise, bestowing a certain validation and authority. After Shawqi passed away, Khalil Mutran took his place as the president of Apollo’s Society. So while there was a new vision and encouragement of creative risk-taking, there was also a sense of history and lineage. The intention to link with tradition was made clear through the involvement of these esteemed, elder poets. AL: And for you, how does this research/writing fit into the rest of your work? Visual art, cultural appropriation/borrowing? How does it resonate with your other projects? JG: I have always been interested in the archive, and my work as a visual artist, whether painting or new media, has long been research-based. In other words, the contents of the archive I’m researching determines to a large extent the nature of the resulting project. The earliest instance I can think of where I was conscious of this way of working was in the late 90s, when I was compiling declassified images and films of US atomic tests and producing paintings and agitprop. I decided to organize the many links to source material that I had amassed in the form of a website: http://TheBombProject.org For some years I continued to work on it and add to it. Now it stands as an archive of the project itself, and to the time prior to the advent of RSS feeds and social media, when people aggregated links on static websites. Now I find that I am dealing with a large, ungainly and fragile physical archive, the Abushady archive amassed by my mother and aunt. It’s extraordinary that it exists at all, and I’ve only recently become aware of how extensive the material is. I’m actually still unearthing parts of it. The fact is, no one in my family for several generations has ever thrown anything away. I have ephemera from 1930s Egypt that includes movie tickets and playbills. I have visas, student ID cards, and death notices. Abushady kept carbons of seemingly every letter he ever sent, and he saved every response. In some instances he collated the full correspondence of several years in chronological order. I found personal letters in both English and Arabic, cables, sketches, and of course, an enormous number of photographs. The visual information tells a story all its own, of course, and has been essential to my writing this book. But it is massive enough, visually startling and significant so as to present a separate project. So, this is the archive that I am dealing with as a visual artist. After I organize it all, I will need to scan it and digitize it online. Essentially, the project is a portable museum, an open access, virtual Abushady museum. I proposed this project for post-doctoral work, and I have a place offered me at Winchester School of Fine Art at the University of Southampton, in their PhD program for visual artists. It is a program that emphasizes interdisciplinary research across the arts. I am looking for funding so that I can start. In the meantime, I have a book to write. Front cover of Apollo, Feb 1934 issue. Thankyou for this, Marcia. What a lovely read, and what a wonderful publication to anticipate. Good luck to Joy. I didn’t know about her work till reading this. It looks really interesting. Thanks to Marcia :+) and thank you Marilyn, I’m glad the virtual archive sounds exciting. I of course would love to know more about AZA and Mahmud Bayram al-Tunisi! FYI: A good part of Abu Shadi’s books, and copies of his papers are kept in the Special Collections department at the University of Utah Library. The books preserved in their collections illustrate his interests in beekeeping and freemasonry, in particular. Thanks! I’ve passed it on to Joy. I had the chance to visit the library last summer and go through Abushady’s papers, (original as well as copies: ~28 archival boxes of stuff, if memory serves, much of it indexed, but not all). And of course, there are books by Abushady and about him listed in the general catalog. Those books that were from his collection are harder to track down since they’ve been dispersed throughout the library’s collections….. But I did find a book in the open stacks, a volume of his introductory remarks at a 1922 London conference on the standardization of bee husbandry, published by the Apis Club….